Please note that the content of this book primarily consists of articles available from Wikipedia or other free sources online. 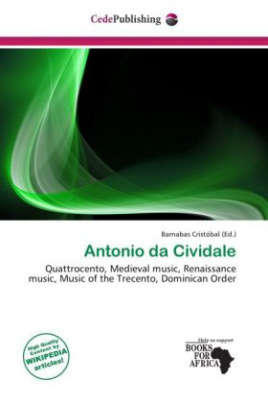 Antonio da Cividale was an Italian composer of the early Quattrocento, at the end of the musical medieval era and beginning of the Renaissance. He is one of a few Italian composers of the early 15th century whose works have survived; they are transitional between the Trecento and the early Renaissance styles. While a few details are known of his life, both the beginning and end are obscure. There has been confusion over dating of some of his compositions, some of which has been resolved recently, and most of his activity now seems to have been in the first two decades of the 15th century. He was a friar of the Dominican order; from his name, it can be inferred he was from the town of Cividale del Friuli.